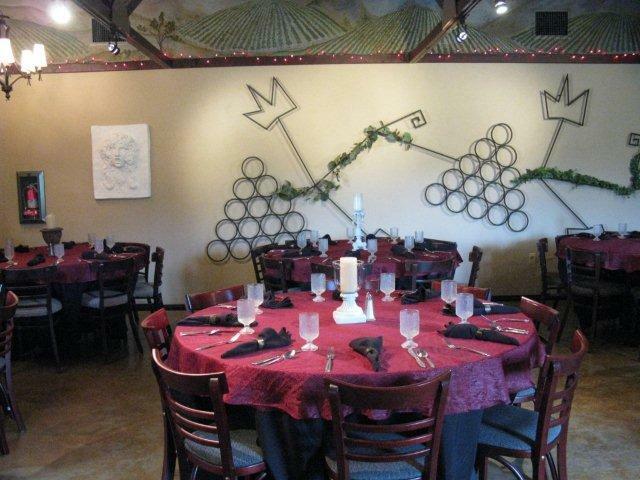 Private party guests may reserve our Private Dining Room for groups of 24 – 48 people. Call Chuck at 951-676-9463 between 11:00 and 5:00, Monday through Friday and he will put you in touch with Carol to schedule a date and work out the details. A small intimate setting with round tables seating eight persons available for parties of 24 to 70. Available for lunch and dinner. Inlcudes fresh vegetables, hot rolls and butter, coffee, tea, lemonade for self service. *Lunches include hot sourdough rolls and butter, fresh seasonal vegetables, coffee, tea, lemonade for self service. Wine and beer are not included but may be added to your total bill or billed separately. $100.00 deposit and signed contact required to reserve room. You may reserve the private dining room for less than 24 but you will be billed for the minimum 24 people. The following special wine prices are offered for private parties only. Baily Rosé of Sangiovese $25. Wine may not be purchased from tasting room to serve at your function. ABSOLUTELY NO OUTSIDE FOOD, BEVERAGES, WINE OR BEER. CAKES FOR SPECIAL OCCASSIONS ARE THE EXCEPTION AND MAY BE BROUGHT IN WITH PRIOR PERMISSION. YOU SUPPLY THE PLATES AND UTENSILS TO SERVE WITH. IF WE PLATE CAKE WE CHARGE $1. PER PERSON. ANY decorations must be cleared with staff before party, no confetti allowed. $100.00 DEPOSIT AND SIGNED CONTRACT DUE UPON SELECTION OF DATE. Call for availability of dates. Hours: Nightly except Saturday and Sunday…5 P.M.-9 P.M.